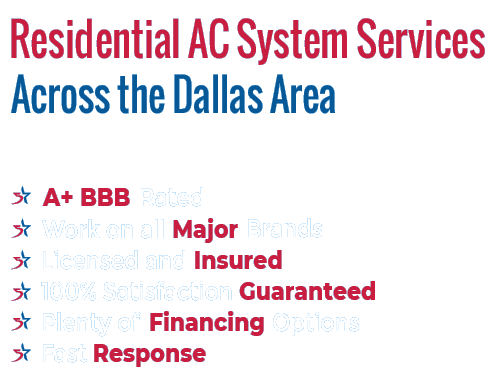 5 Star HVAC Contractors is a leading air conditioning service and repair company, working with residential clients throughout Rowlett and surrounding areas. We provide emergency AC repair, air conditioning installation, preventative maintenance on your existing equipment, and more. If it has anything to do with a residential air conditioning system, you can count on our team to get the job done. So why would you pick 5 Star over the competition in the Rowlett area? We bring a lot to the table. First, we have 20 years of experience under our belts, meaning we can handle any AC repair or installation challenge which may come along. Also, we provide customer benefits such a financing and a 1-year satisfaction guarantee. Our A+ BBB rating speaks to the quality of work which we provide, and our top priority is always the satisfaction of the customer. Don’t take any chances when you need to have residential AC work completed – call 5 Star HVAC Contractors and get it done right the first time. Your air conditioner has to work hard to keep your home cool during a hot Texas summer. Even if you have a quality unit and a modest-sized home, it is still possible that something will break down in the middle of a heat wave. Should that happen, you are going to want to get the unit back up and running as quickly as possible. Like many others before, you can count on 5 Star HVAC Contractors to come through when you need us most. The repair process happens in two phases. First, our team will troubleshoot your system and diagnose the cause of the problem. From there, we will provide you with a quote for the necessary repairs. We don’t want you to be surprised by the bill when the job is complete, so everything about our pricing is upfront and honest. As long as you sign off on the quote, the work will be done properly and you can relax in a cool and comfortable home once again. If you are moving into a new home without an air conditioning unit, adding AC to the home should be one of your top priorities. To get the job done right, and for a fair price, call 5 Star HVAC Contractors right away. Our rates are affordable, but that doesn’t mean we cut corners. The quality of the work and the satisfaction of our customers is always our focus. We are also happy to handle replacement projects when your current air conditioning system has gone as far as it can go. In some cases, it will make sense to simply replace an old failing unit rather than continue to repair it time and again. If you aren’t sure whether your situation calls for repair or replacement, please contact our office for assistance. As is the case with any piece of equipment you own, it is better to provide your AC unit with maintenance along the way rather than waiting for a breakdown. When a breakdown occurs, you have to foot the bill for potentially costly repairs and parts, and you will also have to spend at least a little time without functioning AC. By staying ahead of the game, you may be able to avoid that outcome altogether. 5 Star HVAC Contractors will be happy to establish a maintenance schedule for you, based on the age of your system, along with other factors. You don’t get to decide when your air conditioning system is suddenly going to break down and be in need of repair. In fact, these things tend to happen at the worst possible times. When you trust 5 Star with your repair work, you won’t have to wait long to get back up and running. We offer around the clock emergency services, every day of the year. 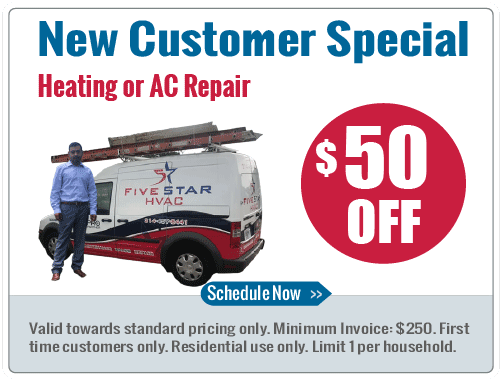 Thank you for considering 5 Star HVAC Contractors for your air conditioning repair and installation needs. We are proud of the strong reputation we have built in and around Rowlett, and we look forward to serving this community for many years to come.